Runners’ Lab is anything but a regular specialist dealer. Since 1980, we have been advising not only beginning and experienced runners, but also top national and international athletes. Using our extensive experience and passion, we select only the best technical products on the market. We believe that comprehensive service and personal contact are essential if you want to ensure every runner and walker has only the best possible experience when practising their favourite sport. Each technical running shoe, hiking boot, or sprint spike is constructed differently, according to specific needs. For example, surface, weight, distance, past injuries, foot type and gait all play an important role. Our consultants will work with you to find the shoe that fits you best. In this way we seek to reduce your risk of injury. Personalised adjustments to your shoes and insoles are made with the utmost care and skill in our famous workshop. How can we ensure that you will choose your new pair of shoes based on more than only your favourite colour? Very simple. By not having the shoes on display in our stores. Wondering how our consultants will help you find the best type of shoe for your unique foot profile? Find out more about our comprehensive methods on our website. It’s now also possible to make a reservation! 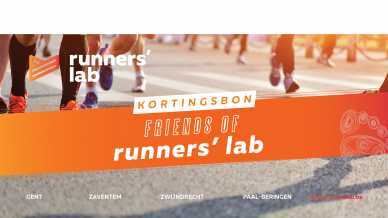 If you’ve already been wearing your favourite shoes for years now and have already had a Runners’ Lab Analysis carried out, you can book your shoes here and collect them in the Runners’ Lab branch of your choice. No time to drop by, but you need some gear for your next match or training session? Then put your new outfit together here. Prefer to drop by to try it on? Then please have a look at our collection here. If you forget something during a visit to Runners’ Lab, or you already know exactly what you want, you can also easily have it delivered to your home or work. As the largest specialist running shop in Belgium, we have the most diverse and specialised product range. Until recently, a lot of our ‘mysterious stock’ couldn’t be viewed by customers. From now on we would like to change this, so that you can now simply go through our stock online. Limited editions and hard-to-find models are now even easier to discover! Through our years of experience and our reputation among major brands, we currently have the widest range of spikes in all fields. We refuse to be influenced by the online price war. Because we are far from a regular retailer, we like to show that things can be different. You can count on our well-known after-sales service for all your online purchases. This means that you are always welcome to get the help of one of our consultants for additional advice, personalised modifications or product exchanges in our physical stores. We can’t provide you with the same level of advice that you will be used to getting when visiting one of our stores. This is why we would like to offer you a Friends of Runners’ Lab discount of €15, or a €20 gift. Every loyal customer will receive this discount after every purchase in one of our branches. Not yet a Friend of Runners’ Lab? Email us at webshop@runnerslab.be, and we’ll send you your discount! Find out more here.